Undefeated World Boxing Organization (WBO) junior lightweight champion and 2013 Fighter of the Year nominee MIKEY GARCIA (33-0, 28 KOs), of Oxnard, Calif., and two-time world title challenger and current No. 1 contender JUAN CARLOS BURGOS (30-1-2, 20 KOs), of Tijuana, México, hosted an international Media Conference Call from their respective training camps on Tuesday. Garcia and Burgos are in the final weeks of training before their world title fight collision at The Mecca of Boxing -- Madison Square Garden in New York. The Garcia - Burgos world junior lightweight title fight takes place on Saturday, January 25 and will be televised live on HBO Boxing After Dark®, beginning at 9:45 p.m. ET/PT. The telecast will open with a 10-round battle between undefeated heavyweight contenders Bryant Jennings and Artur Szpilka. BOB ARUM: This is going to be a great fight and this is going to be a great event. It’s wonderful for me personally to be back in New York and back in Madison Square Garden. ARTIE PELULLO: I would like to thank everyone involved in the show. There was a disappointment when Juan Carlos had the draw against Rocky Martinez last January. We did believe he won the fight but nevertheless, the WBO and Paco Valcarcel made Juan Carlos the number one contender and Alex and I were able to make an arrangement with Carl and Bob that we would be the first title defense and we are grateful for that and Bob’s right – it is going to be a real good fight. These are both good fighters. Mikey Garcia is at the top of his game and it’s going to be a difficult fight for our guy and we believe he is going to win the fight and he has been training hard in Tijuana. You are going to see two guys that don’t know how to back up and everybody knows that so it’s going to be a great fight. ALEX CAMPONOVO: Juan Carlos has had two chances for a world title. We know about Mikey Garcia and Juan Carlos has been preparing like we have never seen before. JUAN CARLOS BURGOS: Good afternoon to all of you and it’s a great honor for me to speak to you all. And I want to say hello to all of you from Tijuana. MIKEY GARCIA: I’m happy to be back. It was a great fight last time I was at The Garden and I am looking forward to this opponent who is in front of me. I know he will be difficult – he has had great accomplishments in the boxing ring. After his last fight a lot of people thought he should have been the champion. It’s going to be a good fight and it’s going to be a good card. There are some really good fighters and Burgos and I are going to put on a great show for the fans. Mikey, how do you feel about fighting in New York? MIKEY GARCIA: It’s really good for me to fight on the east coast and in New York. 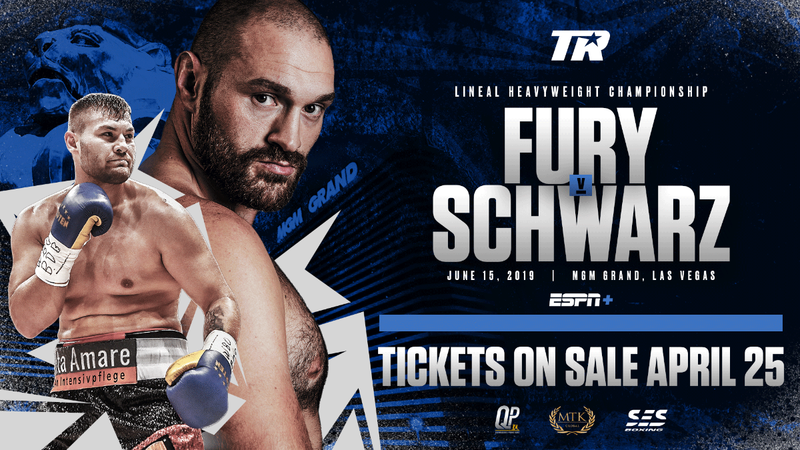 This is a real big boxing venue – big fights, historic fights have taken place there and I just want to make sure the fans see a good show and remember watching me fight in that arena. They are real boxing fans there. They are not just there to watch the main event. They are there to watch the whole night of boxing. That’s what is great about being in New York. And boxing is alive and it’s great and I am really happy to be back. Do you feel fighting in New York makes you a bigger star? MIKEY GARCIA: Fighting in New York is a great feeling. And fighting in Madison Square Garden is a big deal to me, but it all depends on if the fans don’t show up it doesn’t matter. If they do come and show their support and show their love and admire me as a fighter – that is what I strive for and that’s the best. Did you watch the Burgos-Martinez fight while you were in the dressing room? MIKEY GARCIA: I didn’t get to watch the fight when it happened and I have only watched a couple of rounds from that fight. My dad and Robert watch the video of my opponents. I just watch a couple of rounds here and there. What is your plan at this weight class? MIKEY GARCIA: We will have to look at the options after this fight. Hopefully everything turns out well next week and we can move forward with our plans. We’d have to look at the top fighters in the next weight class and if I do that I have to grow into the weight class. I would like to unify the titles before moving up but if there is something better at 135 then I will go there. Then I can unify the titles there or move up to 140 if the right fight is there or what options are available. It’s not easy to put a fight together and in this business you’ve got to look at everything before you can move up in weight class. MIKEY GARCIA: I would have to make a fight at 135 before moving up to 140. I feel that 135 would be a very good division for me and I think I can do something in the lightweight division. Talk about how the Amidu fight played out? JUAN CARLOS BURGOS: I am in a perfect position at 130 lbs. Yes I took that fight but it was important to do it. I couldn’t back out of it and compromise the promoters and the venue and the TV – I wasn’t going to back out of a main event fight. Obviously the jump in weight affected me because I was prepared to fight a smaller guy or a guy with a smaller frame. However, I watched the fight a couple of times and it looked like the judges were going against me – it was the second time I had a draw – the first was against Martinez and the second one was against Amidu. I felt strong throughout the fight – I didn’t think he hurt me or anything and according to what I saw I thought I won the fight – it may have been a short margin but I thought I won the fight. Bob, do you feel Mikey is a Top-10 Pound for Pound fighter? BOB ARUM: Yes, I believe that he is a Top-10 Pound for Pound fighter right now and soon he will be universally accepted as the best pound-for-pound fighter in boxing. What makes you say that from his last couple of fights? BOB ARUM: He’s a complete fighter – he has great technique and great defense. He is a powerful puncher and when he throws his punches it is with great intent. In other words he doesn’t waste a lot of punches. He measures his opponent and then throws his punches accordingly with a lot of power. So he is a complete fighter and he is getting better. Mikey, do you feel you are Top-10 Pound-for-Pound? MIKEY GARCIA: I do feel I am at least a Top 10. I’m just starting as world champion and I still have a lot to prove. I had some good fights last year but I am just here to do my job. I don’t pay that much attention to ratings to Top 10 lists – I just take it one fight at a time. 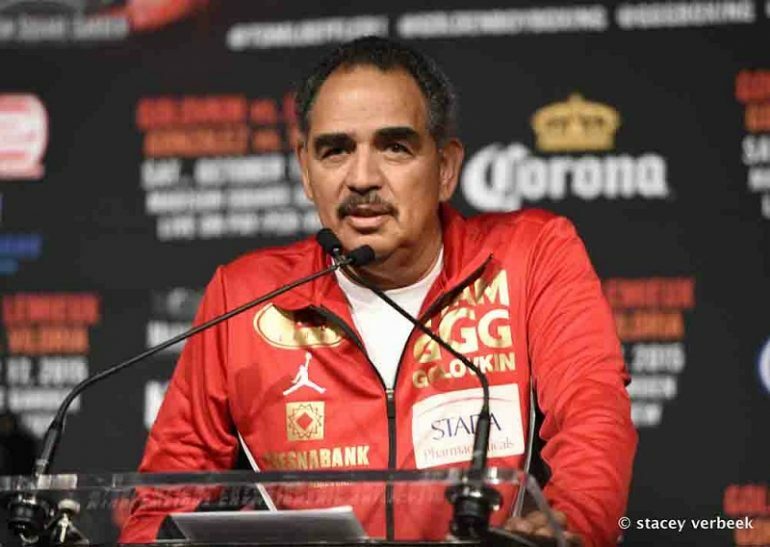 Juan Carlos, you are taller than other Garcia opponents – do you think that is an advantage? JUAN CARLOS BURGOS: I know that I am tall for the division and when I was fighting at 126 I was tall for that division. I will try to use that to my advantage against Garcia because I know that I am taller than he. I will try to maximize all of my qualities inside the ring and at the same time try and exploit all of the mistakes that Garcia might make in the fight. 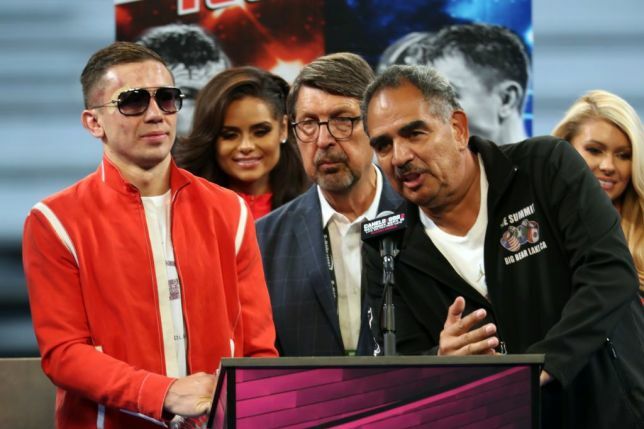 As far as the Martinez fight comparing how each of us did – again that was a difficult chapter and whatever happened that night happened and I can’t dwell on that anymore. You all know that decision is on my record and I can’t change it. The only think I concentrate on right now is my future fight and that is against Garcia on the 25th. Nothing else matters to me. I am extremely focused and worked very hard like never before to fight a great champion like he is. I have prepared myself mentally and physically with my team for the 25th and that’s all that matters to me. How important is it for you to fight in New York? JUAN CARLOS BURGOS: It is an honor and a privilege to fight again at Madison Square Garden in a historic place where legends have been made. It is a pleasure for me to be there for the second time in my career – especially against a fighter like Mikey Garcia who is a young champion that I truly respect because of all his achievements. But all of my respect for him will go out the window on the 25th because I have a goal in mind and that is to become world champion. I have to do my job to take away his undefeated record and I am working extremely hard to achieve that goal. MIKEY GARCIA: It is an honor to be fighting in Madison Square Garden. A lot of great fights have take place there and I hope the fans will remember this fight also. People have treated me very well in New York and I hope that everything goes well for me next week there. Because of your last two fights ended in draws – do you feel you need to KO your opponent? JUAN CARLOS BURGOS: You can say that those two draws were not just. I worked very hard in those fights to get the win and unfortunately two judges did not appreciate my work in the ring. But like I said before I am not looking at the past – I am looking at the immediate future, which is Mikey Garcia. In regards to the knockout, I don’t think about that. Like most fighters in the world today – I let him come to me and we see what happens. I am just going to go out there and do my work and to put everything into play what I have practiced. Bob, how do you see the future schedule of Mikey Garcia? BOB ARUM: It’s one fight at a time. A lot is happening in boxing and it happens really quick. 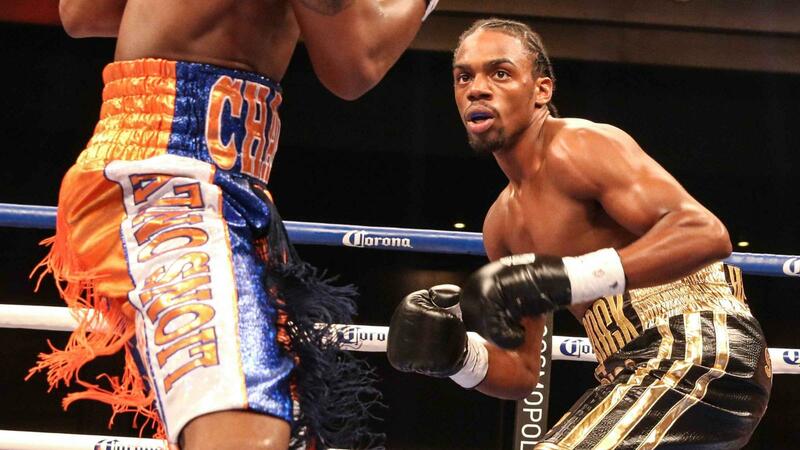 Mikey is one of the few American stars in boxing. We have Mikey and Andre Ward, Floyd Mayweather and Timothy Bradley and there are not many other Americans who qualify as superstars. I envision – Mikey is taking on a lot of these non-Americans in really big fights and where that takes him I am not sure. 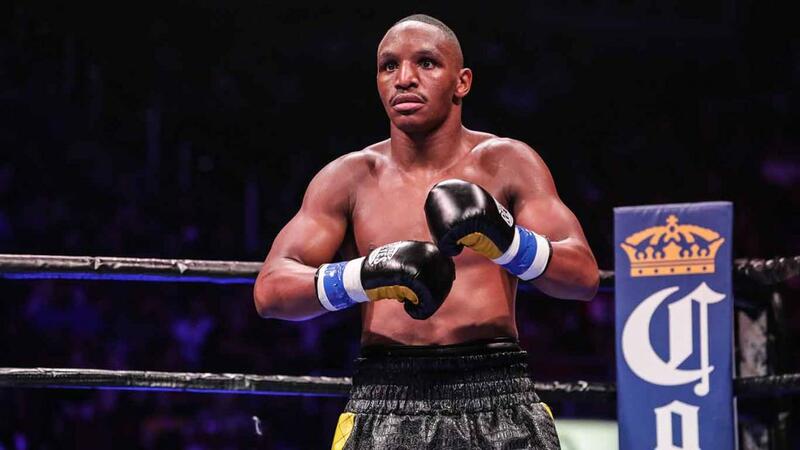 Does it take him up in weight to 135 or 140 then a fight with Pacquiao or does it take him to a tremendous confrontation with Lomachenko if Lomachenko proves himself with Orlando Salido [March 1] and goes forward. Lomachenko, based on his amateur background, was the greatest amateur of all time. Will he be as successful in the pros and if he is will Mikey Garcia be his biggest fight? A lot can happen so we go one fight at a time. – whether he goes up, stays at 130 – that’s going to depend on what’s happening in boxing. Is a fight with Pacquiao in his future? BOB ARUM: Mikey will tell you himself. He was over in Macau when his stablemate, Brandon Rios fought Pacquiao, and he mentioned to some that down the road he would look forward to a fight with Manny Pacquiao. I am a big Mikey Garcia fans and I thought that would be good. MIKEY GARCIA: A lot of people talk – they complain and say get rid of him. But it works well for me and I like working with the guy so why would I change it? What if you do fight Pacquiao and have Ariza in your corner? MIKEY GARCIA: I feel really good working with Ariza and you could see the results when he worked with Pacquiao. He kept moving up in divisions and dominated everyone. If we can do the same thing with me that only makes me a better fighter. We want the best team to help me perform the best. I don’t want to move up in weight class because I am lazy and don’t want to train hard. I will move up when my body is ready to go into that division and with Alex that will help me and I’ll be a lot better than if he wasn’t working with me. Mikey, could you move down? Do you want to stay at 130 or move up? MIKEY GARCIA: Right now I feel really good at 130. I could probably come down to 126. Even in my last fight everything was gong real well and the weight was coming off and I thought I could get to 126. But everyone, Robert, my dad, Alex, Top Rank, would like for me to stay at 130 or move up to 135. I think the plans to come back to 126 are no longer there. I think there are better things at a higher weight class. MIKEY GARCIA: I am a thinking fighter in the ring. I work to pick my opportunities. I don’t watch any film of my opponents. I don’t only look at offense but I look at defense also and that allows me to be the fighter that I am. 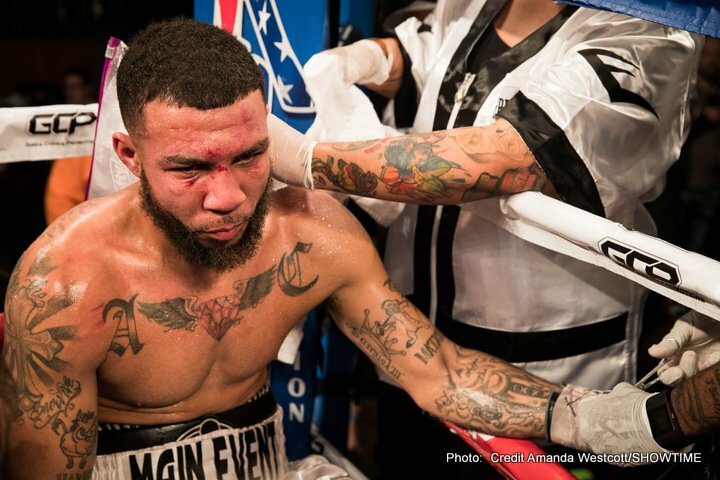 When I got knocked down against Martinez I got back up and went to work. I don’t get too excited either. I try to keep focus on the game plan and I do what I have to do t win the fight. If I need to take another round or two to get adjusted to an opponent I will do that. 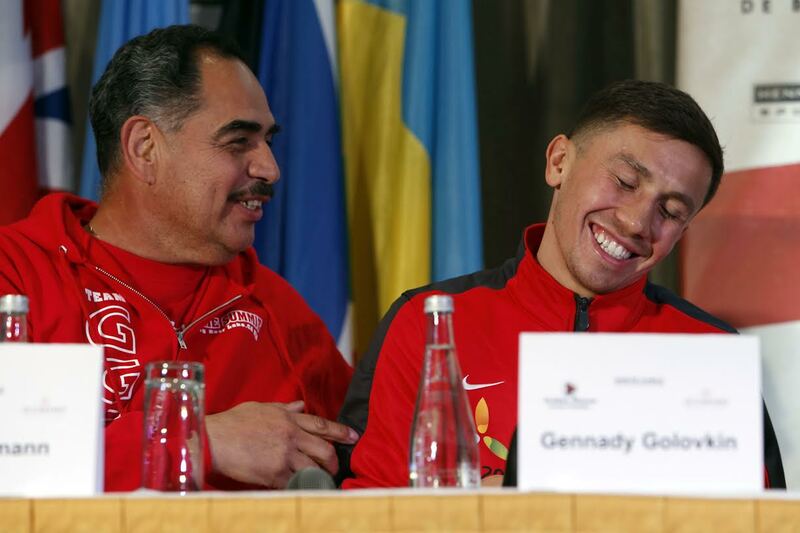 MIKEY GARCIA: That is great to be compared to old time fighters and to have my name mentioned with them is an honor. Juan Carlos, you are actually fighting for a title that should be yours, will that change the way you approach the fight – do you feel you need a KO? JUAN CARLOS BURGOS: It is true that I deserved to win the title last year – January in New York. So now I have to try and win it again but I am at ease with myself because of the three months I have put in the gym but it’s not going to be an easy task because Mikey is a great champion but I feel very strong. JUAN CARLOS BURGOS: To all the fans I hope you get to see the fight either live at The Garden or on HBO on the 25th. I think it’s going to be a great fight to start the year. I have trained to the best of my ability to give everything I have inside the ring and to showcase myself. I hope for the both of us we have real good judges so that the real winner's hand is raised after the fight. MIKEY GARCIA: Thank you, everyone and I am looking forward to the fight next week in New York and hope for a good experience once again and give the fans a great fight.